As more and more owners are looking for alternative ways to help themselves, they are also doing the same for their beloved dogs. Massage therapy works wonderfully for many people, which makes them consider trying it for their dogs. Massage therapy helps dogs by getting them to really relax and often helps improve behavior problems, especially those exhibited by fearful pets. 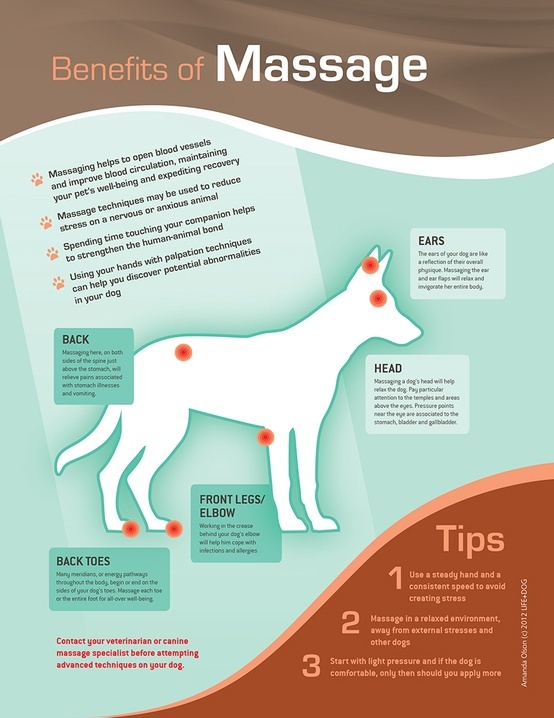 Massage therapy is also quite helpful for a dog’s physical health. It can increase their circulation and improve their joint flexibility. It can be very helpful with patients that are athletic such as agility dogs. Massage can be used on older pets to improve their mobility and the condition of their skin and coat. We also like to perform massages on patients that have injuries or chronic diseases. Massage therapy really works well on patients that are suffering from a lot of pain. Massage therapy can be wonderful, but it is really important to have it performed by someone who knows what they are doing. We are proud to offer massage therapy so that our patients can get the relief they deserve. Please contact us today to learn more about our therapeutic canine massage. Post-op massage for veterinary patients? Just do it! Why it can work wonders. It’s Wonderful for Healing, so Why Is This so Very Uncommon?